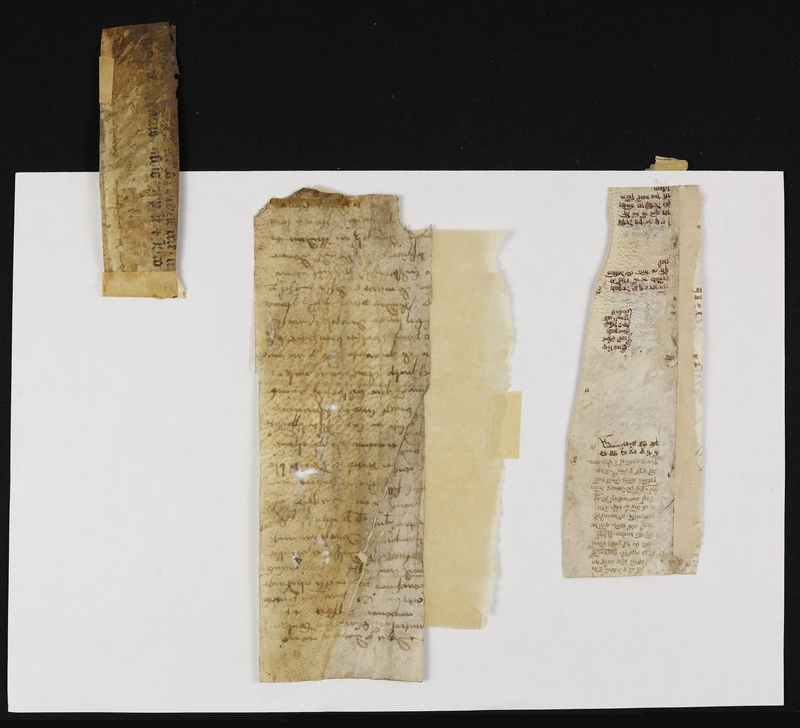 1st Fragment: Written Area: entire fragment, both sides. Highly abbreviated cursive hand. Content: Highly likely that it is a marginal gloss and notes on Aristotle's Metaphysica. Notes and gloss are in different hands, but both are concerned with parts relating to an aggregate or a whole. The (earlier) gloss cites Aristotle and has such underlined lemmata as et erit in diffinicionibus; Resumantur; sed dimittamus; pars etc. Part of the gloss states that a part does not define the whole, because the part is prior to the whole [contrary to De Re Publica, attributed to Aristotle, which states in 1.2 (1253a) that the whole is prior to its parts]. The later notes discuss parts and whole and also form and matter in relation to a whole, a bronze circle, & semicircle in relation to circle. Not just parts in relation to a whole but also the bronze circle and the semicircle in relation to a circle are dealt with in Aristotle's Metaphysica Book 6, Chapter 10-11 (1034b-1037a), and it seems that the gloss and notes refer to these chapters. Have Rosenthal's notes ('Manuscripts from the Collection of Professor Bernhard Bischoff', p. 6 no. 18, taken from Colker's notes). 2nd Fragment: Written Area: 180 x 70mm. Number of Lines: 27. Line Height: approx 6.6mm. Cursive hand. Some bookworm damage. 3rd Fragment: Printed Area: 13 x 111mm. Number of Lines: 2. Line Height: 6mm. Rubication. 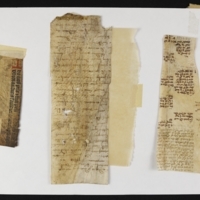 Possibly some faint handwritten notes on verso. From the Monash Rare Books collection of over one hundred fragments of medieval manuscripts and early printed books from the twelfth to sixteenth centuries that had belonged to the world-renowned authority on medieval palaeography (the study of handwriting), Professor Bernhard Bischoff (1906-1991). 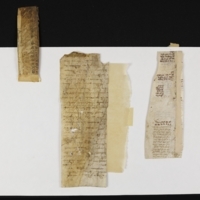 Physical Size: 3 parchment fragments. 1st Fragment: double sided 157 x 52mm, previously glued to brown paper (visible on one side), now detached. 2nd Fragment: 196 x 70mm, glued to pale brown tracing(?) paper (158 x 38mm), which is then sticky taper to a white A4 sheet of paper. 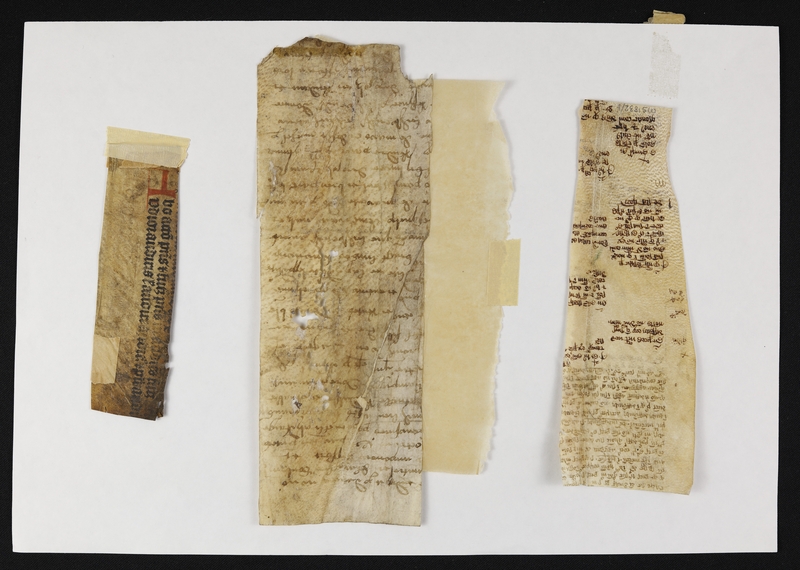 Repairs have been made on the verso with the same tracing(?) paper. 3rd Fragment: doble sided printed fragment (31 x 110mm), previously glued and mended with small pieces of brown paper. Now sticky taped to the same A4 sheet as the 2nd Fragment.